When I mention Gorillaz what do you think of? For those who are more unfamiliar with the band, the popular thought may be that they are the group that is not real. They are cartoon characters, right? Very successful cartoon characters. Since being created by Damon Albarn, who is also the frontman for Blur, and cartoonist Jamie Hewlett, this “virtual band” proved quickly that The Archies were not the only cartoon characters capable of singing and playing instruments. 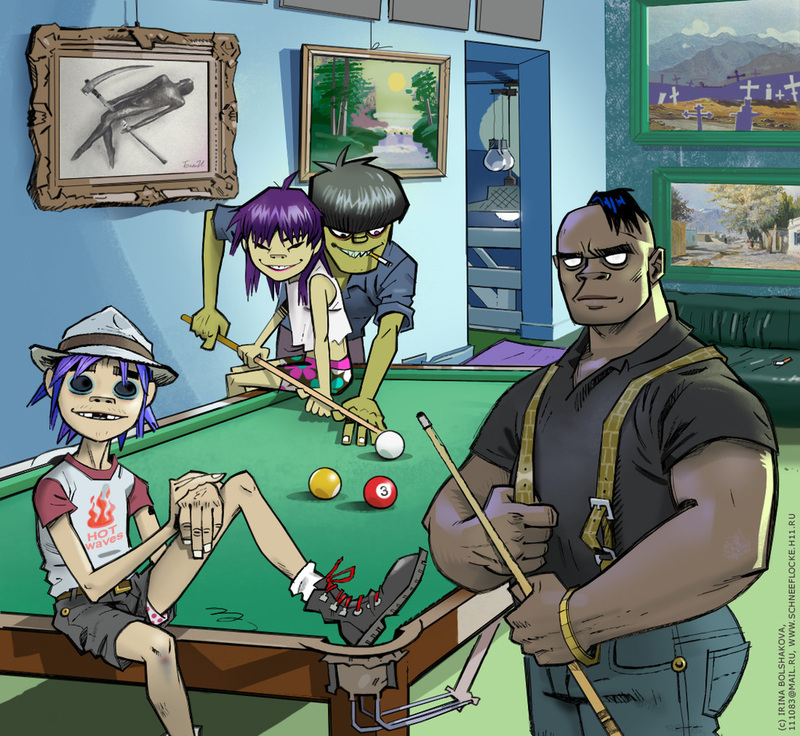 I would venture to say that 2D, Murdoc Niccals, Noodle and Russel Hobbs, are the best animated band to ever play music. It helps that their eponymous debut album sold seven million copies, a Guinness Book record for a virtual band. But, that was a long time ago. Just this past year Gorillaz released their third studio album Plastic Beach. The albums first single “Stylo” peaked at the 24th spot on the Billboard Alternative Chart. Here at the Music Court it gets better treatment. “Stylo” was released as a single in January 2010. And, in typical Gorillaz fashion, it features guest star vocals and a cameo in the semi-animated video. One must understand that Gorillaz music is more so a work of art. What I mean by that is you must consider everything before judging the song. In this case, you must watch the video in coordination with the song in order to get a true picture of the song. So before I go into analyzing it I will include the video below. The song begins with a beat. It’s a funky line that sets the scene well. This hip-hop, alternative dance beat repeats throughout the song. A car’s engine is heard while a car accelerates at the viewer in the video. I love how Mos Def‘s initial rap coincides with the police officer and his cop car. The Stylo car is going to pass at a high speed and he is going to pursue. The rap falls at a great time because it is actually being spit through the police radio (notice the thumping speaker at around 20 seconds). Gorillaz often do an exceptional job combining visual and auditory stimulants that excite and please the listener. Like I implied above, listening to a Gorillaz song and watching any released visual material is like watching a short film. Art and music are combined effortlessly. The guest vocal is done by Bobby Womack. That’s right, the renowned soul singer/songwriter. He was convinced by his daughter to do the collaboration because she was a fan of Gorillaz. Womack told Rolling Stone that he was unsure why they wanted him. His daughter said that Womack was “hip to them” and he went for it. At the studio, Womack was told to sing whatever came to mind during the recording. So, let’s set the scene. Accomplished songwriter comes into studio and is basically told to do vocal improv. Womack did just that and became so passionate that he actually started to pass out. He is a diabetic. He was fine and the song received a strong vocal addition. The best part of the song is the best part of the video. It is very well why this song made it onto the countdown. Bruce Willis, traveling in a red 1968 Chevrolet El Camino, begins to shoot at the animated characters as Bobby Womack has a momentary explosion and does a pure rock n’ roll scream. The end of the song and video shows Willis running the other car off the road. The car dives into the water and turns into a whale with tail lights. And you are left saying…wow…that was awesome, both the song and video.